Launching your career as an IT pro? If your skills sizzle but your resume fizzles, check out this resume sample for improvement ideas. Looking for entry-level IT developer jobs? To be a successful candidate, resume expert Kim Isaacs says it helps to have a comprehensive resume. 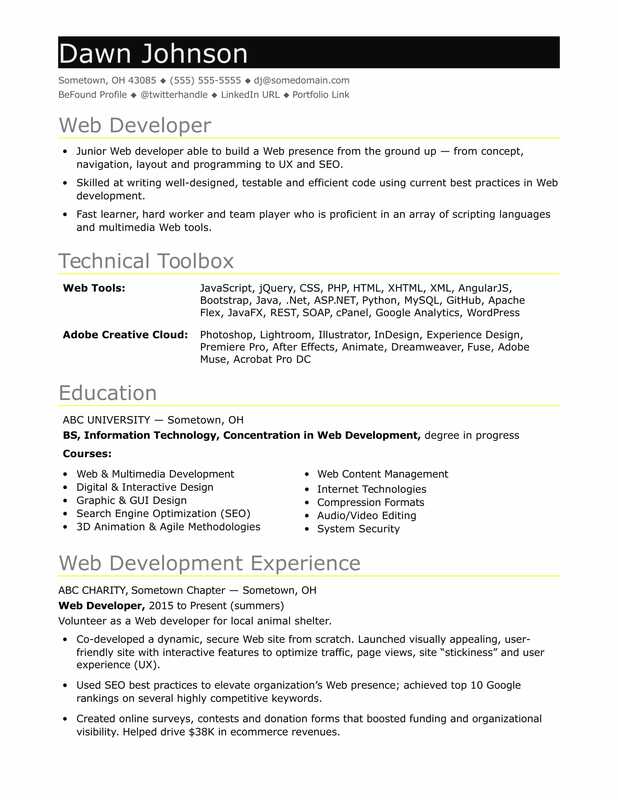 So if your websites sizzle but your resume fizzles, check out this sample resume for an IT developer that Isaacs created below, and download the entry-level IT developer resume template in Word. Great news: Jobs for IT developers are projected to grow by 24% (or 302,500 jobs) from 2016 through 2026, which is much faster than average, according to the Bureau of Labor Statistics (BLS). When it come to where the industry is flourishing, uou'll find the highest level of employment for this job (systems software) in the following states: California, Massachusetts, Texas, Virginia, and New York; and in the following metropolitan areas: San Jose, CA; Washington D.C.; Boston; New York City; and Los Angeles. As a developer, you can expect to earn a median wage of $103,560 per year, or $49.79 per hour, according to the BLS, though an entry-level salary will obviously be lower. Additionally, you can learn about information technology careers on Monster, and check out a midlevel IT developer resume sample and an experienced IT developer resume sample for additional resume format tips. Skilled at writing well-designed, testable and efficient code using current best practices in Web development. As you get ready to kick off your career as a technology professional, you want to make sure you go after the top jobs with a resume that's programmed for success. Not sure your resume is up to the task? Get a free resume evaluation today from the experts at Monster's Resume Writing Service. You'll get detailed feedback in two business days, including a review of your resume's appearance and content, and a prediction of a recruiter's first impression. Let the experts at Monster give your job search an upgrade.